I've read a few books by Janice Cantore, and I just love her novels. As a retired police officer, she writes with a realism I always enjoy. 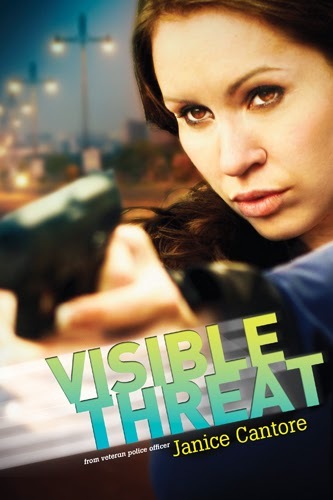 Visible Threat is her newest release, and the second book in a series. The first book, Critical Pursuit, is also fabulous, but this novel does stand alone. I reviewed Critical Pursuit a few months ago, and it was wonderful. I was pretty excited to learn more about Brinna Caruso and her K9 partner, Hero. The best thing about all of Cantore's novels is the realism -- on a high-speed chase, you really feel like you could follow the same path described in the book, as she gives details that scream out that she is describing either a real set of streets, or at the very least, one she has created in detail. The police paperwork, the interaction between officers, the red tape -- these all scream out that Cantore knows her subject. The worst thing about Cantore's novels is also the realism. Cantore talks about subjects, human trafficking in this particular novel, that aren't necessarily a lot of fun to think about. Slavery is still a reality, and it is more prevalent than people want to think. If you are trying to avoid thinking about these modern slaves as real people who are truly being victimized, you may want to avoid this and stick with fluff novels. This book will make you think. Personally, I think that is a good thing. You can check out the first chapter and the note from the author here.